↑ "Hard to say no to free love: Ravi Shankar". Press Trust of India. Rediff.com. 13 May 2003. Retrieved 18 July 2009. 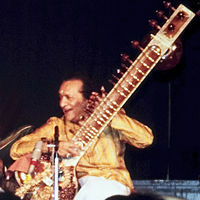 ↑ "Balaji temple in Hyderabad was stage for Pandit Ravi Shankar's secret wedding". The Times of India. Retrieved 13 December 2012.